Exploder J/Z Boards have been in transit for a while and we received them on Friday. Didn´t knew exact version until having them at hand. Glad to see they were the version I wanted, like Matt Struble foils from the NAs 2015. As Exploder Zs like Brewin's, you need to lift one while going upwind. Also Matt showed that this J/Z version can handle calm no problem (beyond being no valid reference as he is in another league..) , but clearly they worked as he could win over Woody Cope's Nikita in 5-6knots. Brad Collet used them to win Aus Nats too (with Brewin smoking the Exp Zs) and Dave Shaw won also NZ Nats on them. Thus I wanted the boards to be exactly what we received, also on Bailey White's comments on their Exp Z vs JZ tests in the US. Spent Friday night staring at these beauties! But on Saturday we had a cloudy humid morning with no wind at all. Forecast called though for a good SouthWest just after noon. 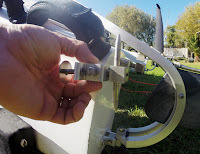 I dedicated some hours adding clamcleats and a rope to lift the new Exploder J/Z foils. First run out of the box the boat lifted like nothing, and had a couple of good height runs, but not that long flights. Second run downwind I started pushing. After some meters of getting all things together as strong gusts started to come in, I sheeted in hard and went for it. The technique I found to be more effective with 2014 J foils is to sheet and then release as you feel how foils/boat lift up, the A drives forward as you release a little, then you need to start trimming again, sheeting in and out, plus body trim: hike a little harder back at the beginning , then moving your weight a bit forward and you start handling the boat in full foiling mode. Traveler as I commented to Bailey months ago, well opened to reduce fighting against the strong heel you have if more centered as Mischa recommends for the DNA. I foil good only when opening the traveller way out, a seen in the video I published this summer, to tramp lace. Bailey told me he tested that setup with good results in his Exploder at the NAs with no pointing loss and even Matt went for a little more open position for the Exploder with J/Zs. The key is that you fight heel lot less and you concentrate on handling with a more relaxed body position. That was the process used also with the previous 2014 J foils, I repeated the drill with this new J/Z version. to maintain the A airborne, and I continued to fly 'long distance' (as I call a good sustained flight) as never before. It was just an amazing feeling going flat while airborne and speeding like crazy, clearly I was experiencing the Next Level on A Cat Class legal foiling. 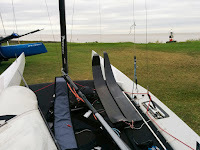 Went through a couple of ribs training windsurfers and saw how they were staring in awe, as I later confirmed. 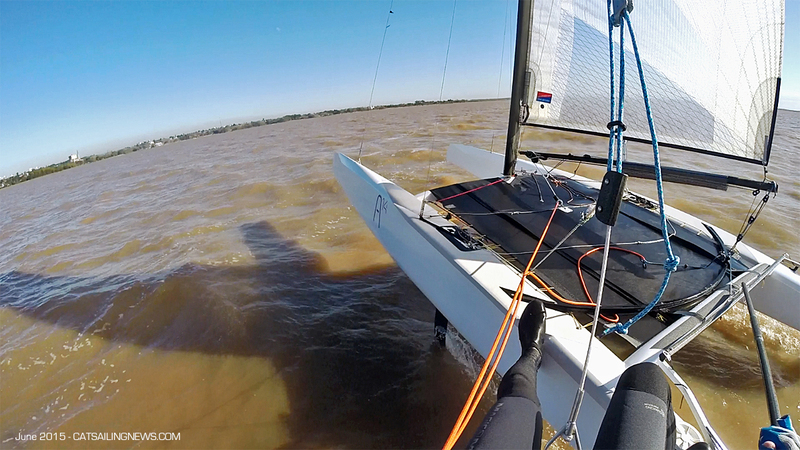 After passing the ribs a gust got me off guard, the leeward hull went digging the bow, and ended a la BAR F20 video !! With my head upside down in the air. On the hurry to sail the new foils, Forward helmet was left at the Club. The boat capsized sideways to leeward , and got some seconds before getting onboard again. My adrenaline was peaking, I was overwhelmed by that incredible ride, and rest off for minutes with the boat drifting along wind & current, got some help later from the rib guys seeing the flight & capsize scene, before uprighting it. Once at helm again got back at ease to the club with the biggest smile ever! 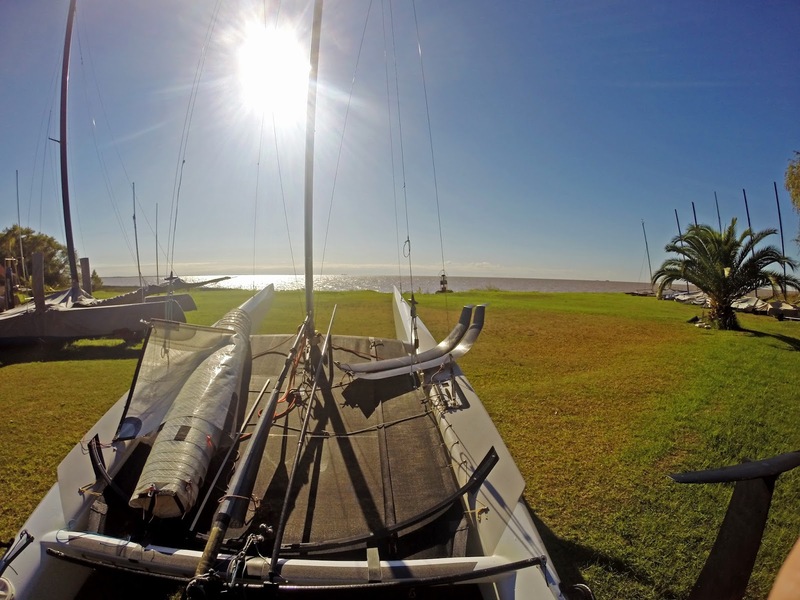 riding any of my beloved 'sliding sports: Surf, Snowboard, Wake, Windsurf & Catsailing. That was the best ride ever on any of these great sports, and I've been in some perfect backcountry snowboarding powder at Las Leñas, perfect waves at Costa Rica, dream Windsurf surf rides at Ilha Bela paradise, plenty of glassy wakeboarding sessions and of course countless Catsaling rides in including foiling with the Exploder, FP & F20. But this first Exploder J/Z foils airborne run is definitely the highlight within my short! aging 42yrs old. To confirm how good the ride was, I told my good friend Julito to call the rib guys, who are friend of him and Sergio, the Garda rocket boy. The rib guy told them that he was seeing a '''Pro''' guy foiling super steady and fast, and knew that guy was not one of them (Julio & Sergio are the top AClass riders & foilers here) as he saw them many times, but never going like that! Hahahaa .. My friend didn´t like that comment that much! Then continuing scene account witnessed just meters from my flight, he told them that at the end "this guy (me) was not that '''Pro''' whatsoever, as he ended the perfect airborne ride with a capsize....!! Gladly he was there seeing the good and the bad, as he helped me get onboard, my body was not reacting at all. 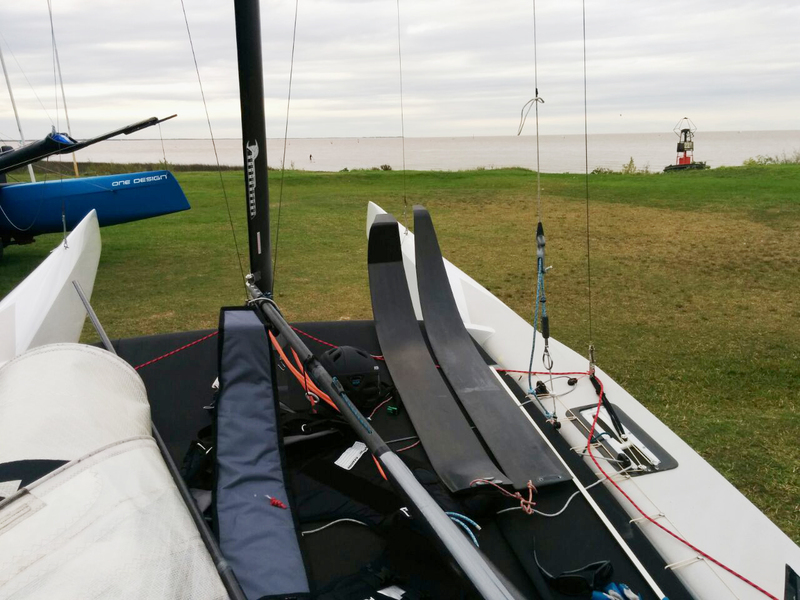 Needless to say if Julito and Sergio grab these new foils they are going to blast them, our river is a great training 'ground' and these two are fanatics and experienced Windsurfers & Catsailors. Watch for them at Punta Ala. Sergio already issued a warning at Garda with the 2015 Dna. Did not have a gopro that Saturday, so I went out today (pic above) with one but a custom gudgeon Ian designed & built, failed, thus didn´t get much foiling to film. Nevertheless the idea is great and he will improve it. JZ comparison vs 2014 J from Sat, sailing and last two pics are from today. Click for orig size and slide show. 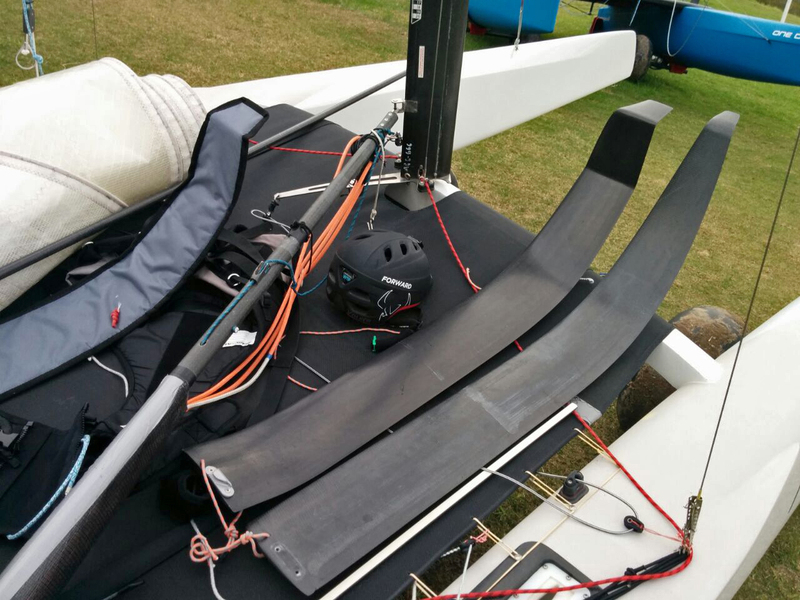 and Matt Struble reported after his first foiling sessions winning the NA 2015: " It is a great time to be a sailor."